Reading each other’s facial expressions is so important to our survival as a species that our brains are hardwired to respond to expressions on faces that aren’t even there. 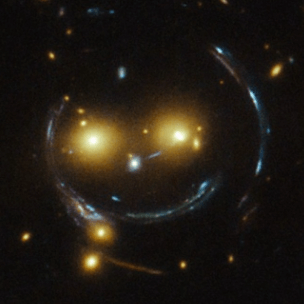 This adorable image — in which the galaxy cluster SDSS J1038+4849 seems to be smiling at the camera — comes courtesy of the Hubble Space Telescope. It was spotted by Judy Schmidt, who submitted a version of the image to the Hubble’s Hidden Treasures image processing competition, where anyone can sift through the Hubble’s massive data pools to highlight hitherto ignored sights from the stars. via The Hubble spotted this smiley face in space – The Washington Post. 9 Feb 2015 in Aesthetics, Amusing, Psychology, Science. Micky Coulter liked this on Facebook.